Hi, friends, and welcome to this lesson! To keep learning more about God, we go right to the source, the Bible, which is God's revelation to humanity. It is His Word, His message, to mankind. There is much confusion about this subject. It is fundamentally important to understand. We truly want to help you learn all you can about God and Jesus Christ, plus we want to help you go beyond that. We want you to come to personally and intimately know God and Jesus Christ as your Father and Elder Brother. This will happen if you get into the habit of studying the Bible and praying every day, and putting the Bible into practice in your everyday life. There was a nonreligious skeptical man who just couldn't swallow the "Jesus story" about an Incarnation, about God coming to earth as a man. But one snowy evening he noticed a flock of birds huddled miserably in the snow, not having any shelter. Well, he couldn't let the poor creatures lie there and freeze, and he thought about his barn. That would provide a warm shelter, if he could direct the birds to it. Quickly he went to the barn, opened the doors wide and turned on a light, but the birds did not come in. He figured food would entice them in. So he hurried back to the house, found some bread crumbs that he sprinkled on the snow, making a trail to the doorway of the barn. But to his dismay, the birds ignored the bread crumbs, and continued to flap around helplessly in the snow. He tried catching them... He tried shooing them into the barn by walking around them waving his arms... Instead, they scattered in every direction, except into the warm, lighted barn. And then, he realized that they were afraid of him. To them, he reasoned, I am a strange and terrifying creature. If only I could think of some way to let them know that they can trust me... That I am not trying to hurt them, but to help them. But how? Because any move he made tended to frighten them, they just would not follow. They would not be led or shooed because they feared him. "If only I could be a bird," he thought to himself, "and mingle with them and speak their language. Then I could tell them not to be afraid. Then I could show them the way to the safe, warm barn. But I would have to be one of them so they could see, and hear and understand." That thought became an epiphany. Stunned, he remembered the fundamental message: "And the Word became flesh and dwelt among us" (John 1:14). Suddenly the gospel he had heard made complete sense! He dropped to his knees in the snow. What Does the Bible Tell Us About the Father and the Son—the God Family? There is much confusion about this subject. There is only one God, but God is a family, composed of God the Father and God the Son. The Son is also called "the Word" who became Jesus Christ (John 1:1, 14). They are also "one" in the sense that the Father and Son are identical in character. Notice the plural pronouns in Genesis 1:26: "Then God said, 'Let Us make man in Our image, according to Our likeness'" (emphasis added throughout). The Bible clearly identifies two Beings who make up the one God. But what about the Holy Spirit? The Bible doesn't describe the Holy Spirit as a separate divine Being. It is revealed as the Spirit of God the Father and Jesus Christ—the power that emanates from Them that They use for many different purposes. The idea of God being a "Trinity" became popular centuries after Jesus Christ's time. It is not taught by the Bible. That idea originated in ancient paganism. The Bible is full of many, many proofs that God is not a Trinity. However, disproving the Trinity is not the subject of this lesson. One widespread misconception is that there was a difference—in fact, a major difference—in the character of the God of the Old Testament (primarily strict and harsh) and Jesus Christ in the New Testament (merciful and loving). This lesson will show the surprising biblical truth. First, can we prove that Jesus existed prior to His human birth? "And now, O Father, glorify Me together with Yourself, with the glory which I had with You before the world was." "Father... you loved me before the world was created." And He [Jesus] said to them, "I saw Satan fall like lightning from heaven." In Luke 10, Jesus refers to the fall of Satan that occurred before the creation of Adam and Eve. Many other scriptures could be quoted to prove that Jesus existed prior to His human birth. For example, Luke 10:22 shows that Jesus, and only Jesus, had firsthand, intimate knowledge of God the Father. The next section further proves Jesus' preexistence. Was Jesus Christ also God before and after His incarnation? "I [Jesus] and My Father are one." In John 1, we learn that "in the beginning" there were two Beings who both were God. The rest of the chapter clearly shows that the One called the Word was the One who became Jesus Christ. He was incarnated—"became flesh"—at His human birth, but He existed forever prior to that. The New Testament is full of proof that Jesus was God. Jesus did what only God could do: forgive sins and raise the dead. Jesus allowed people to worship Him. Paul refers to Jesus in Titus 1:3 and 2:10 as "God our Savior." And since Jesus was and is God, that means He has existed for all eternity! What passage most clearly shows that Jesus was the God of the Old Testament? Plainly, the God who was leading the Israelites out of Egypt, through the Red Sea and into the Promised Land was Christ! Christ provided manna to eat (Exodus 16:4, 31, 35) and water to drink, sometimes from solid rock (Exodus 17:6). Calling the food and drink "spiritual" has a dual meaning: It was supernaturally provided, plus it also represented the spiritual sustenance Christ was providing as the bread of life and the water of life (John 4:14; 6:30-35). What does the New Testament and Jesus Himself say about God the Father that prove the Father was not the God of the Old Testament? "And the Father Himself, who sent Me [Jesus], has testified of Me. You have neither heard His voice at any time, nor seen His form." "Not that anyone has seen the Father, except He [Jesus] who is from God; He has seen the Father." The God of the Old Testament many times visibly appeared to people and audibly spoke to people, which proves He was not God the Father. Who was the actual Creator of the universe, the earth and all things? For by Him [Jesus Christ] all things were created that are in heaven and that are on earth, visible and invisible, whether thrones or dominions or principalities or powers. All things were created through Him and for Him. ...God who created all things through Jesus Christ. All things were made through Him [the Word], and without Him nothing was made that was made. God the Father authorized the creation, but it was Christ who actually did the creating. John 1:3 is clearly referring to the Word, the One who became Jesus Christ, as the rest of the chapter shows. Colossians 1:17 verifies that He had to exist "before all things," since He created all things. Who originally made the Sabbath a holy day? And He [Jesus] said to them, "The Sabbath was made for man, and not man for the Sabbath. Therefore the Son of Man is also Lord of the Sabbath." The word sanctify means to set something apart as sacred or holy. When God rested on the seventh day, He made it holy. Mark 2:28 clearly implies that Jesus Christ is the One who made it holy. How does the name "I AM" help prove that Jesus was the God of the Old Testament? Then Moses said to God, "Indeed, when I come to the children of Israel and say to them, 'The God of your fathers has sent me to you,' and they say to me, 'What is His name?' what shall I say to them?" For what reason did the Jewish adversaries try to stone Jesus? Because He referred to Himself with one of the names of God, the name by which God revealed Himself to Moses. It would have angered the Jews if Jesus had said, "Before Abraham, I was" or "Before Abraham, I existed." But by Jesus referring to Himself as "I AM," they were angered even more because He was clearly and pointedly identifying Himself as God. Some other places where Jesus referred to Himself as "I AM" are John 8:24, 28; 13:19; 18:5, 8. Notice in John 18:6 that when Jesus identified Himself as "I AM" to the arresting party, they were miraculously knocked to the ground. Notice how "I am" is included when Jesus identifies Himself as "the bread of life" (John 6:48), "the light of the world" (John 8:12), "the door" (John 10:9), "the good shepherd" (John 10:11), "the resurrection and the life" (John 11:25), "the way, the truth, and the life" (John 14:6) and "the true vine" (John 15:1). These are often referred to as the seven great "I AMs." Significantly, in the Old Testament, God identifies Himself in some of the same ways, such as being our shepherd, our light and our life. What can we learn from studying the subject of Melchizedek? [Melchizedek, who was] without father, without mother, without genealogy, having neither beginning of days nor end of life, but made like the Son of God, remains a priest continually. And having been perfected, He [Jesus] became the author of eternal salvation to all who obey Him, called by God as High Priest "according to the order of Melchizedek." Melchizedek appeared to Abraham as both a king and priest. In fact, He was "king of righteousness" and "king of peace" (Hebrews 7:1-2). Verse 3 reveals that he was an eternal divine being, having no "beginning of days nor end of life." A careful reading of Hebrews 7 proves that Melchizedek was the Word, the One who became Jesus Christ. Knowing that the God of the Old Testament was the One who became Jesus Christ shows how totally false the idea is that there was a difference in the character of the God of the Old Testament and Jesus Christ in the New Testament! They are one and the same. Knowing this also supports the fact that there is perfect continuity and harmony between the Old and New Testaments. 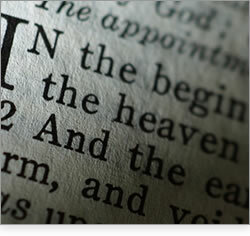 The Old Testament serves as the foundation for the further revelations in the New Testament. As we've seen, Jesus Christ came to reveal the Father. So contrary to popular belief, the Old Testament reveals the Word, and the New Testament reveals the Father! If previous to this lesson you thought that the God who spoke and appeared in the Old Testament was God the Father, you may now have quite a challenge in changing your perspective. To get you started, jot down three or more main things you remember about God from the Old Testament, and then substitute "the Word" where you previously thought of "the Father." Next, jot down three or more main things you remember about Jesus Christ from the New Testament, and focus on how that same Jesus Christ was also the divine being who spoke to and interacted with human beings throughout the Old Testament. Once you get used to this perspective, the whole Bible will make more sense to you.